Are You Ready to Move-N-Order? Are you moving? Are you asking yourself these questions? When do I start packing? I am not ready to move out yet but need to get my house ready in order to list it, where do I begin? What tools do I need in order to keep myself from losing my mind? Are there specific things I should consider when moving from one house to another beyond how many boxes to buy? I have been living in my current place a long time, where is the best place to begin packing? I have kids, what should I do to help them? How do I pack dishes? What is the best way to handle packing electronics? How do I manage all of the boxes and furniture on moving day? How in the world will my movers, or friends, get my belongings placed into my new home the way I want without micro-managing and making us all crazy? How will I know if all of my stuff makes it to my new place? I dread writing multiple labels on every box, how can I streamline the task? How can I identify where all of the furniture should be placed? How can I make the movers more efficient with their time since I am paying them by the hour? How much would you give not to stress over all of these issues? How much would you give to keep more $$$ in your own pocket rather than the moving company’s? How much would you give to know that all of your boxes and furniture are actually placed in the correct room? How much would you give to have all of your furniture placed and set up in the correct arrangement? How much would you give to not have to be running all over the house, micro-managing the movers? 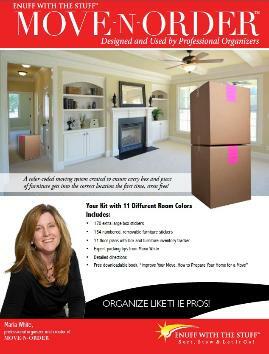 If you want to have the easiest, least stressful move, then take a look at how the Move-N-Order system can not only help ease your mind and address all of the concerns listed above, but it can help keep $$$ in your pocket! This entry was posted in Residential Organizing and tagged Move-In-Order, Organized Move, Product. Bookmark the permalink.